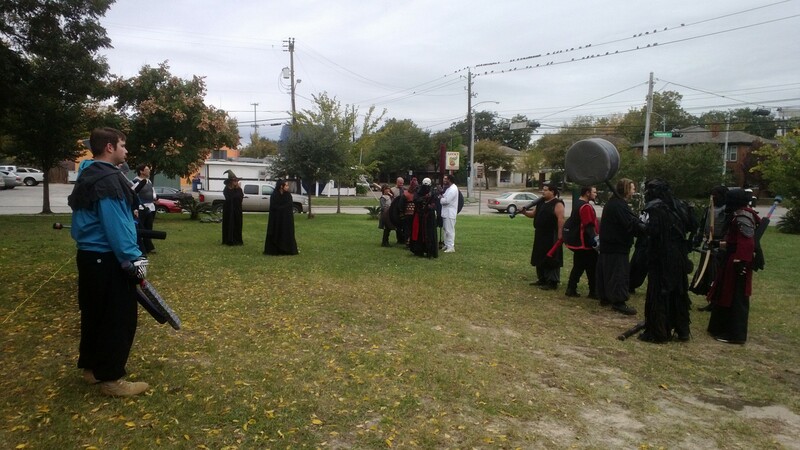 I reached out to Houston’s own LARPing group, the Dagorhir Far Harad, and set up a studio interview with their main organizer, Merce Torres. After my interview with her, I went out to Mandell Park to record ambient sound and interview some of the participants. I also took photographs and recorded video. Locals from the Montrose neighborhood slowly make their way to Mandell Park every Sunday. They grab a seat and crack open a beer as the party atmosphere sneaks in. In front of the spectators is a sight that looks to be a scene lifted straight from Lord of the Rings. They are watching the LARPers of Montrose…er, rather…the “Far Harad Realm of Dagorhir Battle Games.” On the surface, battle gaming or LARPing is exactly what it looks like: a bunch of friends dressing up and fighting with foam weapons. But Merce Torres, leader of the Far Harad, says there’s more to it than that. She says it actually creates a sense of camaraderie. You get some exercise without having to think about getting exercise. You get to vent because you are hitting things. You get friends; we form units of teams, basically. So if you find guys that you really respect and you like the way they fight, then you form a unit. It’s like a really nice friendship, basically. The fighting begins at two and to random passersby, it may look like a disorganized mess, but members of the Far Harad show up early to run practice drills and prepare fighting styles. As Bjorn Gatecrasher, NOT his real name, will attest, this is serious business. This place is ridden with demons. I come here to help rid this land and free the people. Every kind. Straight demons birthed from hell itself to random Orc raid parties. Slay the demons and remember what is best in life: crushing your enemies, seeing them driven before you and hearing the lamentations of the women! There are Dagorhir battle game realms all over the world and each offer a different approach to battle gaming. Torres says the Far Harad emphasizes role-playing a bit more than other realms, but is really only concerned with everyone having fun. We actually tend to be a little bit more nerdy. Because, when you’re talking about a big event with hundreds of people, it’s what we call “stick jocks”, they try to be the fastest, they try to be the best. But with us, since it’s mostly hanging out with our friends, we get a little bit more into the role play. We get a little bit more into the, you don’t have to be the best, but we do definitely encourage you to try your hardest. To be an adequate fighter, a safe fighter, a respectful fighter. So I’d say we’re actually a bit more nerdy than the rest of them. But we wear it like a badge of pride more than anything else. If you’re not into role-playing, and don’t have a character name, it’s okay. The Far Harad won’t turn you away. Ali Joffrey is a college student who wields an 8-foot polearm when he steps on the field. He was one of the few people at Mandell Park who wasn’t playing a character. I mean it’s recommended, but it’s one of those things that sort of happened. I haven’t found anything I want to stick with and really I’m just happy being me. The members of the Far Harad make all of their own weapons and armor, giving players another avenue to express themselves. Torres says that crafting equipment is a big source of revenue for Dagorhir. Dagorhir is supposed to be a nonprofit. But we as a group sell things at conventions to raise money for us traveling to other events, which are basically campouts for dagorhir, to fund us traveling to the national event. Yes, that’s right – there is a national LARPing convention, called…Ragnarok. Jackra is actually a hive mind of multiple people to explain why I keep coming back after I die. The plural is Jackra-Dan. I’m currently in the employ of the witch over there. Not a whole lot of actual LARPing or character here, I’m just the faceless meatsack that the bad guys use. What’s undeniable about the Far Harad? They are having the time of their lives. They live for Sunday afternoons at Mandell Park. Torres does not deny the therapeutic effect stepping into another person’s skin can have. Doing it out in public though, in a park with people and the random passerby that wants to know what you’re doing, that gets a little bit stressful. But when you take friends and you do it as a group you find comfort in that. So it’s more of you coming out of your shell is the big thing. For Houston Matters, from the fields of the Far Harad, I’m Conner Clifton. Who Are Those People Staging Battles in Mandell Park on Sundays? They’re LARPers from Houston Matters on Vimeo.